The Grand Egyptian Museum is by all means a reason to be hopeful about the future of tourism in Egypt; it’s everything every Egyptian hoped to see in their country. It’s the largest archaeological museum in the world, build on 117 acres, or about 480,000 square meters, and hosts approximately 100,000 artifacts, 3,500 of which belong to King Tutankhamen and will be displayed together for the first time in history. These artifacts are being conserved now at the Conservation Center nearby to get them ready for the inauguration of the GEM in 2018. This museum is expected to change the concept of tourism in Egypt, said Dr. Omar in an enthusiastic energetic presentation to a group of journalists and representatives of the Japanese Embassy in Cairo during a press tour to development sites Japan is assisting with. He said he expects that this artistic masterpiece will attract from 4 million to 8 million visitors a year, four times more than those who now visit the Egyptian Museum. The GEM will ensure that every object is creatively presented, with the Great Pyramid being the main artifact of the museum, as visitors will have the chance to see it from a window designed specifically for it. Not only this, it will have restaurants, museum for children, souvenir shops, etc. to make it easier for a tourist to stay all day in the Pyramids area. 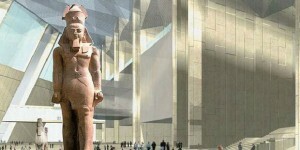 “The GEM would compete with the most prestigious museums of the world, even if a tourist visits Egypt for a day, they have to visit it,” said Wagih Hanna, the head of technical oversight of the Executive Committee for Project Implementation with a warm smile, and expressed his thanks to the government of Japan. …If this project is implemented as planned, it will help tourism get back on its feet and it will have a huge impact on the cultural, economic and even the political spheres in Egypt and the region. This entry was posted in Tourist Sites by TOET. Bookmark the permalink.